This is a guest post from Addie Wagenknecht, Chair of the 2013 Open Hardware Summit. The 2013 Open Hardware Summit will take place on September 6, 2013 at the Massachusetts Institute of Technology. The annual conference is organized by the Open Source Hardware Association, and features speakers, demos, and panel discussions centered on the topic of the Open Source movement. Speakers this year include world renowned leaders from industry, academia, and the maker community such as Becky Stern, Director of Wearables at Adafruit, Marcin Jakubowski, Founder of the Open Ecology Project, Amanda “W0z” Wozniak, Engineer at Wyss Institute, and Eben Moglen, Chairman of Software Freedom Law Center. This year the Summit team is excited to team up with the Ada Initiative to offer five Open Hardware Fellowships for women. These fellowships include a $500 travel stipend and admission to the Summit. In addition there will be five Fellowship tickets for women for admission (sans travel stipend) to the Summit. To apply, please fill out the application form before the end of the day August 18th, Pacific time. Update: We had so many strong applications that we awarded 6 tickets and 7 travel scholarships, and still couldn’t grant one to every person who deserved it. Thank you to all the women who applied and hope to see you next year! My hope is by offering women the option to attend by offering the Open Hardware Fellowships that we as a community can encourage more women to participate actively in future years. At my first internship, there was no women’s bathroom in the office. Now we have many strong women leaders and speakers in our field and I personally want to continue the trend. I hope by inviting you into this community, I can support you as others have supported me. This is a crucial time in open hardware where we can shape the future of the whole field together. We are just on the edge of what is possible. Let’s do this! I really look forward to meeting you at MIT. See you at the Summit! Do you want to support women in open hardware? The Ada Initiative is a non-profit dedicated to supporting women in open technology and culture, including open hardware. Our advisory board includes Alicia Gibb, founder of the Open Source Hardware Association. 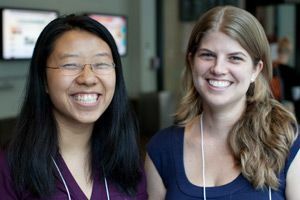 Our programs include the AdaCamp unconference for women in open tech/culture, Impostor Syndrome training, and making conferences safer for women. Donate now and support women in open hardware! Our fundraising drive ends August 30th, 2013. This entry was posted in Ada Initiative projects, Events for women in open tech and culture, Scholarships and grants on August 13, 2013 by Ada Initiative.